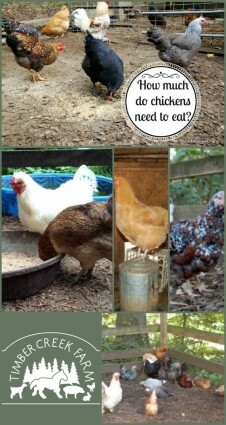 I had a reader ask me recently,” how much food does a chicken need to eat per day “. This is a very valid question and it will differ depending on where you get your information. For instance, if she had asked a meat bird facility manager, he would be able to tell her how much each chicken is fed almost to the exact gram. A commercial egg producer, likewise, will probably be able to tell you a precise amount of feed that is given to each hen per day. Commercial chicken facilities need to optimize the cost/production ratio. But in the case of a small backyard flock of chickens, the answer gets a bit muddy. Let me explain. 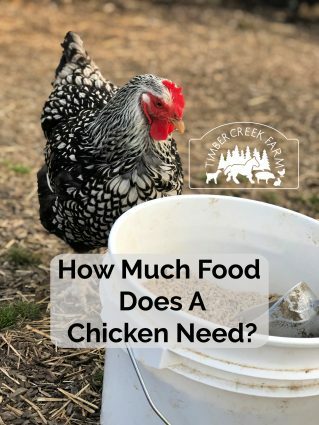 How Much Food Does a Chicken Need to Eat? 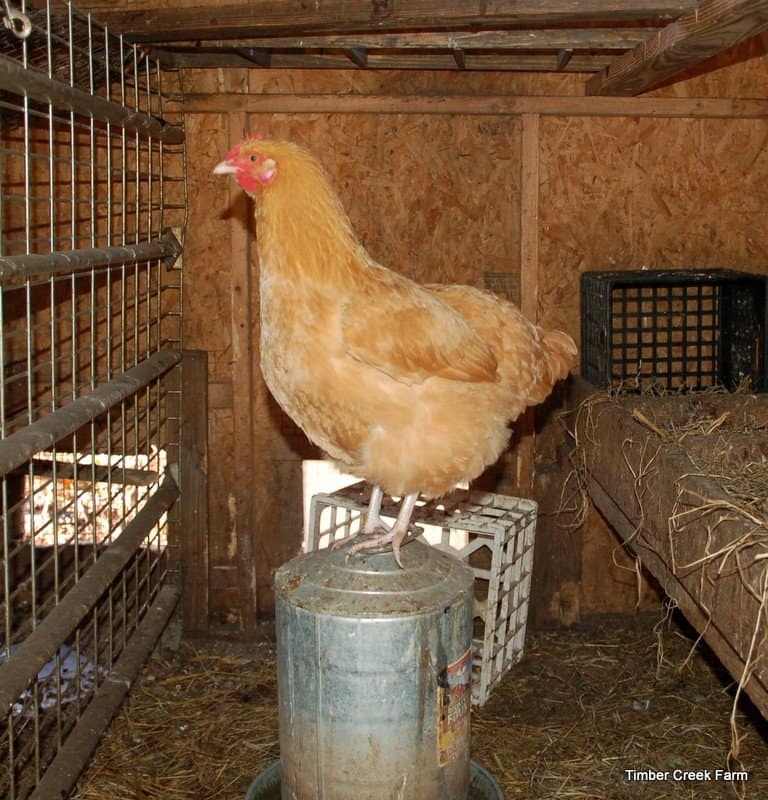 Many factors go into the amount of chicken feed needed per day for a back yard flock. 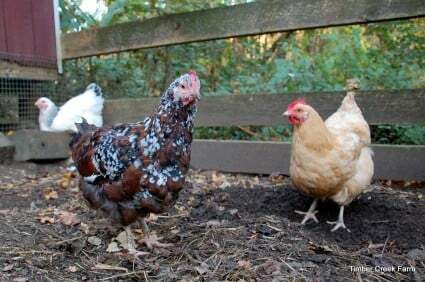 While you may be interested in raising chickens and receiving fresh backyard eggs as economically as possible, you probably also realize that this is not your primary concern. For the backyard chicken flock of lets say, six hens, you are also not looking to make a profit on selling eggs. While it will be nice to sell a few cartons of eggs a year to neighbors and co-workers, it will not keep you in the black on chicken keeping. In my opinion,the best you can hope for is to break even on a small flock. It is a mistake to not provide enough feed for your flock. Chickens eat from sun up to sun down. I notice that our flock eats a lot first thing out of the coop, and again, right before heading into the coop for the night. Feeding too much scratch grain can be detrimental because the chickens will choose that over the more nutrient dense ration. I tend to still lean towards over feeding the crumble ration, instead of guessing exactly how much the chickens will need. We use wide shallow bowls for feeding, which also means we lose some feed everyday to “billing out”. Billing out is when the chickens scoop feed out and leave it on the ground. Also, the chickens will scratch through it with their feet and kick some feed out of the bowl. Using a hanging feeder may help with this problem and keep feed waste to a minimum. Some people feel there is less waste when feeding a pellet ration instead of crumbles or mash. I am not sure I see much of a difference between the two myself, so I just feed what my chickens seem to like better. Are Certain Chicken Breeds Better on Food Economy? 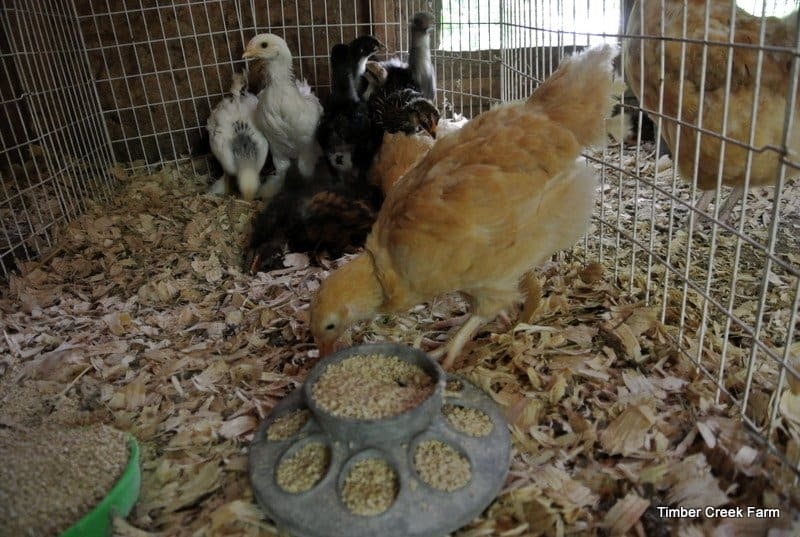 The breed of chickens you have might have some bearing on how much feed they need to consume. 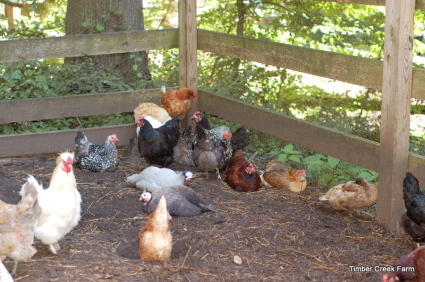 This is a good topic to research when choosing the breeds for your backyard flock. Some breeds are good at foraging for food. Leghorns, Buckeyes, and Ameraucanas are a few breeds known to be good at foraging. Mixing your flock with good foragers will help keep food costs to a minimum. How do we get a ball park figure on how much it will cost per week to feed this flock of six chickens? 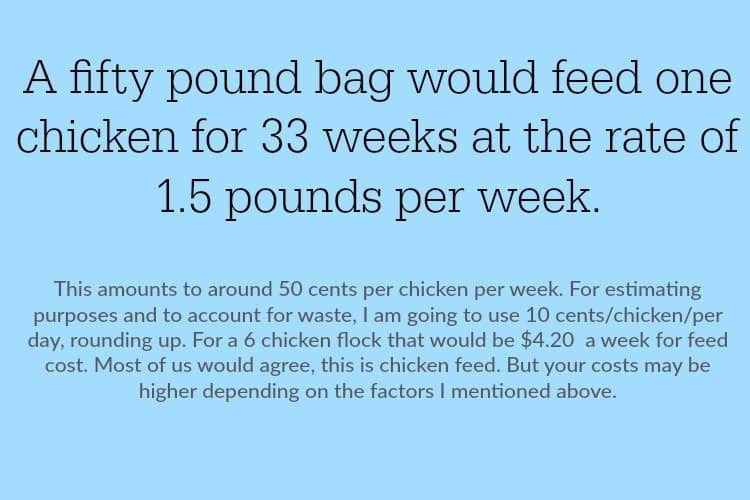 A well known ballpark figure for estimating purpose is 1/4 pound of feed per chicken per day, or, 1.5 pounds of feed per chicken per week. Keep in mind that this is a ballpark figure. I think I feed a little more than this amount. Most feed is sold in a fifty pound sack. For estimating purpose, I am using $16 per 50 pound bag, as this is an average for my area for natural chicken feed. If you plan to feed organic feed, the cost in my area (east coast) will be double that. There are cheaper options on feed, but I advise you to read the labels carefully and ask questions if you don’t recognize an ingredient or question it’s being included in the feed. Soy free options exist but will cost a bit more and are harder to locate in some areas. Organic feed is available, too, such as Manna Pro and Scratch and Peck. Larger feed manufacturers are rolling out new organic versions of layer feed, too. So just how much food does a chicken need? 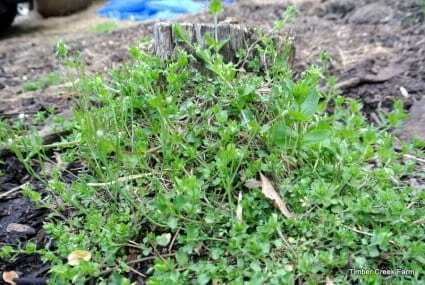 Chickweed and other common plants thought of as weeds can be great sources of free nutrition for you flock, as long as you don’t use chemical weed killers and fertilizer on your lawn. My method of free choice feeding involves four feed bowls for 25 chickens. I give them feed in the morning, along with leftover veggie scraps. The run is large so they have room to forage for insects. In addition, supplements are offered free choice and also given as treats. We do free range, but only when we can keep watch. We are in the woods and the risk of predators is great. 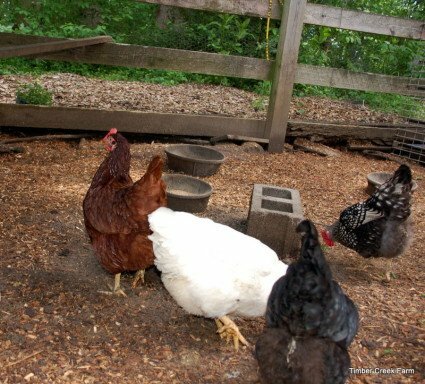 Before we had the fence around the poultry area, the chickens rarely had a time to free range outside of their run. It worked because the run is large and we provide grass and leaves and weeds for them to peck through. Since we installed the fencing, the chickens can be out foraging more often. The amount of feed we use each week has dropped by half. I still don’t recommend full free range due to predators. But, even using free ranging part time has had a big effect on our feed bill. 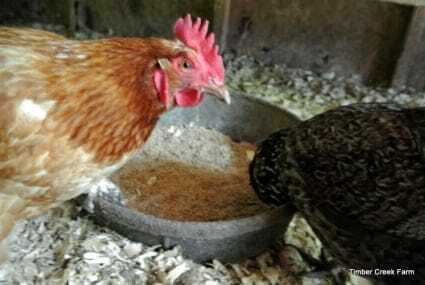 A great idea for supplementing your chickens feed is to grow fodder. This is actually sprouted grains and packs a big nutrition punch. Murano Chicken Farm uses fodder to help keep the feed cost down. In my book 50 Do it Yourself Projects for Chickens, I show the process in photos with a description. Adjust the amount of feed based on what you see left in the bowls at the end of the day. I want the chickens to have enough to eat both first thing out of the coop and also, to have feed available right before dark. These are the times I witness the most intense eating. In between, food should be available, as chickens will continue to graze all day long. We do not leave food in the coop while the chickens are sleeping. The feed left in the coop will attract vermin. You do not want to attract these pests, so I highly recommend taking the leftover feed back to the storage area at night. Sprouting or fermenting the chicken feed is another method of cutting cost by increasing nutrition. The sprouted grain or fermented feed offers an easier to digest form of nutrients. Fermenting increases the nutrients available to be absorbed from the feed. In addition B vitamins, Folic Acid, Riboflavin, Thiamin and Niacin levels are increased. Decide whether your flock prefers pellets or mash. Choose a breed of chicken that is good at foraging for its food. Do not leave feed out at night for the raccoon, rats, skunks, mice to picnic on. The question, how much food does a chicken need, has many variables in the answer. It is possible to be frugal with the chicken feed and yet make sure that your flock gets plenty of nutrition that they need without limiting food intake. 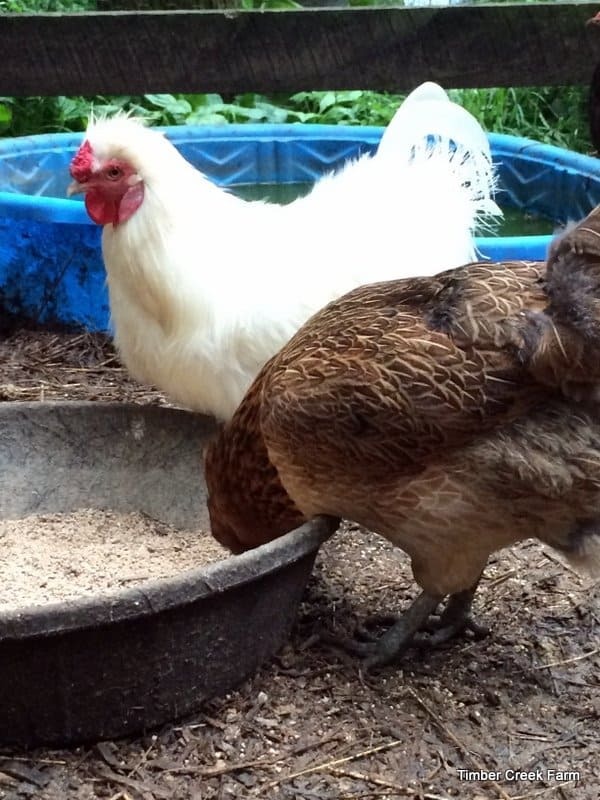 While you won’t be looking at the chicken feeding project the same way as a commercial facility, it is possible to keep from wasting feed while raising your happy backyard chickens. 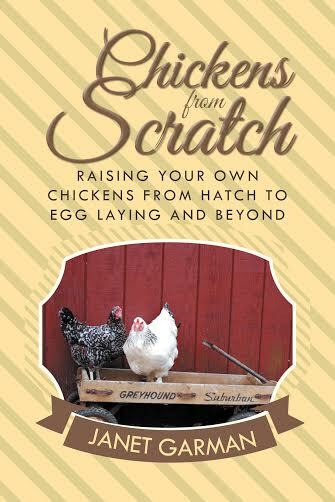 Grab my new chicken care book! It’s packed with projects that will give your chickens the best life. From housing to health care and lots of fun ideas, 50 Do it Yourself Projects for Keeping Chickens is the book you need in your home library. grab a copy here or on Amazon.